Limbo, the superhit indie puzzle-platformer from Playdead, is on sale for dirt cheap on the Google Play Store. In case you are not familiar with the game, Limbo features a boy traversing through a dark (literally) world to save his sister. You will come across various obstcales, monsters, etc which you will have to defeat, or trenches, or other dangerous surfaces, which you will have to cross with the help of your wits (and maybe something you can find). Limbo is widely regarded as one of the greatest games ever made, including by yours truly. The only minor issue I have with it, is that the gameplay itself is quite short, and with such a brillinat game, you want more to play. So, there’s that. Nevertheless, it is a fantastic game, well worth the full price. 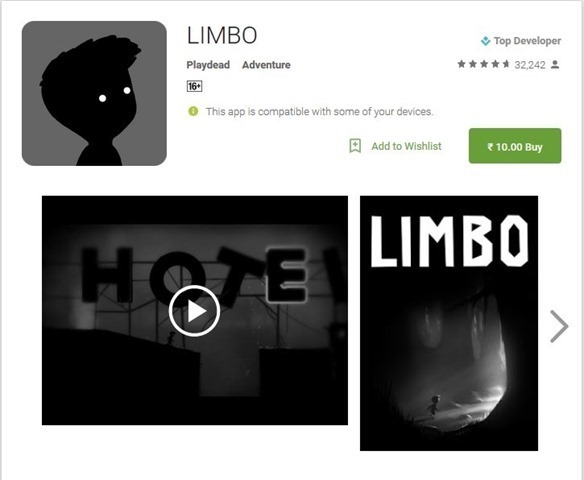 The game normally costs around $4.99 or Rs.330 in India, but you can buy Limbo for Rs. 10, for a limited time from the Google Play Store. Limbo is a premium game with no In App Purchases. There is a Free demo available which you can try before you buy the full version. Note: The game may be incompatible with some devices like the Redmi Note 3. But if you have another device to purchase it on, perhaps you can try it on that and ask the developer to add your device to the list of compatible devices.